Right to raise her grandchildren! Endorsed by: Alexandria House; Global Women’s Strike/LA; Womenscircle@occupyLA; Women of Color/Global Women’s Strike. Contact us to let us know if you can go to court on Tuesday morning! End racial, income & education bias in the child welfare system – Reunite Ms Carolyn Hill with her Nieces! Defend the Hill family from racial, income, gender & education bias in the child welfare system! 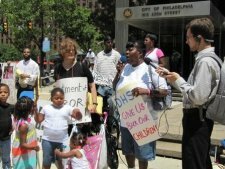 Sign the petition demanding the Philadelphia Department of Human Services return two girls unjustly taken from their aunt who was their full time caregiver.Not being a high school grad or having a GED must not used as a reason to remove children from their caregiver! holding DHS, child advocates & agencies to account before they decide to demolish families. Your help is needed! There is much to do to win justice for these children and their carer! Don’t cha know we love ya? 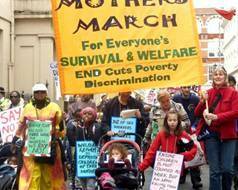 Invitation to Endorse Petition to the US Government: End poverty of mothers & children. Recognize Caregiving work. Support the RISE Act (H.R. 3486) and Reintroduction of the WORK Act. See background and what you can do to support this campaign. Please email us at philly@allwomencount.net if you would like to endorse and participate, or call 215-848-1120. We look forward to hearing from you. TANF or welfare “reform” dismantled welfare as a right for the most impoverished families and made it into “workfare” which is a forced work program for no wages at all or below the minimum wage as a requirement to get meager welfare benefits. This shredding of the safety net has been devastating: since its passage in 1996, extreme poverty among women-headed households has nearly tripled. 1.46 million households live on less than $2 per person per day. 16.4 million US children live in poverty, 7.4 in extreme poverty. Nearly 17 million American children struggled with hunger in 2011, the latest number available from the U.S. Department of Agriculture. The impact of welfare “reform” is that single mothers and their children are the fastest growing populations of homeless people are, a disproportionate percentage of whom are of color, and mothers are the fastest growing population of those who are imprisoned. With no income, with the safety net in shreds, mothers have no choice but to do what we can to feed our children. It should be no surprise that when welfare is cut the number of single mothers arrested for prostitution increases. Others have had to choose between homelessness and returning to an abusive partner. If we are a victim of domestic abuse or become homeless, child welfare accuses us of failure to protect our children, detains and places them into foster care with strangers or on a fast track adoption schedule. In fact, welfare “reform” transferred money from single mothers and our children into child welfare agencies. The numbers of children removed from their homes and placed in foster care – especially but not only from families of color – due, not to abuse or neglect but to poverty, have skyrocketed since the passage of welfare reform. We are asking for your endorsement of a bill now in Congress: the RISE Out of Poverty (RISE) Act (H.R. 3486), by Congresswoman Gwen Moore (D-WI). With RISE, we would finally have an opportunity to make substantial changes in welfare “reform” that would shift policy towards elimination of poverty rather than simply reducing welfare rolls. To tackle child poverty, RISE would re-establish the entitlement of mothers – the first caregivers and child protectors – to society’s support for the work of raising the next generation and caring for entire communities. We are also asking that you support the reintroduction of the Women’s’ Option to Raise Kids (WORK) Act which would give single mothers on welfare the right to raise their young children up to age three fulltime at home, abolishing their workfare requirements. WORK was introduced into the last Congress by former Congressman Pete Stark of CA. Please see the petition and call to action. We hope you agree with them and urgently lend your name and/or organization. Initiated by: Global Women’s Strike; Women of Color/Global Women’s Strike; Every Mother is a Working Mother Network. See invitation to endorse and background. Please email us at philly@allwomencount.net if you would like to endorse and participate, or call 215-848-1120. We look forward to hearing from you. forward this endorser letter on to my/our contacts asking that they join in supporting this campaign (click here for a printable copy). undervalued. We are part of the 99%! The RISE and WORK Acts are life-saving breakthroughs, not only for those of us who have been working for our own and others’ right to welfare, but for all those who want and/or are working for a just and caring society. We know that ending poverty is key in every area of economic and social justice including: the right to have and raise children or not; pay equity; halting the taking of children by child ‘protection’ agencies simply because of mothers’ poverty; the rights of incarcerated people, people with disabilities, domestic violence survivors and those who are LGBT; and much more. Additionally, demanding resources for mothers, other caregivers and those of us with the least is ecological and anti-war: it redirects economic and social policies so that caring for people and the environment is the aim, not war and profit. Every year climate change brings more, and more severe, drought, hurricanes, and flooding while wars and corporate plunder tear to shreds everything worth caring for, bringing all life on the planet to the brink of destruction. 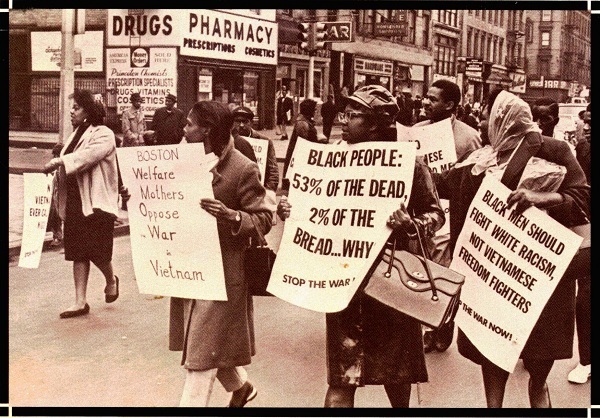 In order to stop it, we must see how caring for people and the planet are indivisible, as the welfare rights movement of the 1960s and 70’s did in taking actions against war as a central part of winning the demand for welfare and for a guaranteed annual income. As stated in the often-quoted “Declaration of Independence”, we take the right to survival (life), liberty and the pursuit of happiness to be “self-evident” – basic human rights. But there is no guaranteed survival for any of us without welfare, resources for those of us with the least. Fifty percent of people in the US are at or close to the poverty line. Other countries are watching too, and in the UK, women pressed for and won an Early Day Motion in Parliament Early Day Motion 683 welcoming these US bills and saying “If the UK government is going to copy the US, let them copy these bills.” Invest in caring, not killing. They have also initiated a petition, Invest in a caring society – A living wage for mothers and other carers. We hope you will add your endorsement and thereby show support for the growing grassroots movement against poverty and for resources for those of us who do the essential work of caregiving. Our work as mothers and caregivers must be recognized and valued! We are entitled to welfare and other resources for that work in the US & everywhere! Philadelphia, June 26, 2013 – Mothers, aunts, grandmothers, and supporters were shocked that Philadelphia’s Department of Human Services (DHS) received a United Nations Public Service Award. Many women have personal experience of having their children taken by DHS without there being factual charges of abuse and often on grounds where poverty is considered neglect. They gather regularly in a storefront in Germantown to share strategies and resources to get their children back from foster care. Take Carolyn Hill who has an August 20th hearing in PA Superior Court to get standing in court concerning her year-long fight with DHS to return two nieces to her care (see attached Q&A). DHS removed the girls without any criticism or complaint of abuse, and against the wishes of the entire family. Why? Because Ms Hill does not have a GED. “DHS abused their power, falsely told the court I was being evicted, never let the court know how well the girls were doing with me, or that I was in the process of adopting them and entitled to legal help,” said Ms Hill. ”This is a problem in city after city across the U.S. Is the UN not aware that there is contention between communities and child protection agencies, that people, especially if they are poor or Black, fear the DHS?” Ms Carroll asked. 1) How did the children come to be placed in Ms Hill’s care? 2) How were the children doing when taken from Ms Hill’s care? All agreed they were doing well and there was no abuse or neglect. The older girl went from being traumatized and withdrawn to being a happy child gaining speaking skills. 3) What led to the children being taken? A new social worker from Lutheran Children and Family Service who took over when Tabor Services lost its adoption license decided Ms Hill was not adoptive material because she did not have a GED and because of a negative Parenting Capacity Evaluation. 4) What was in the Parenting Capacity Evaluation (PCE)? The Lutheran social worker arranged to meet Ms Hill “to talk”. When the social worker arrived she took the children with no notice, warning, court order, or chance to prepare the girls. She took the children on the eve of the Easter holiday so Ms Hill could not get touch with anyone to object. 6) What happened in the court hearing on April 9, one week later? A DHS social worker told the judge that Ms Hill was being evicted and had financial problems and mental health issues – none of this was true. Ms Hill has been in the same house for 13 years*. DHS did not tell the court that Ms Hill was pre-adoptive. Ms Hill was present but was not allowed to speak. On these bases, the court denied her standing and approved the removal. ** Ms Hill is convinced that if the court knew the truth, the children would still be with her. 7) Why didn’t Ms Hill appeal? Ms Hill who is low-income and the aunt, not the mother, was denied standing after her status was misrepresented as a foster carer rather than a pre-adoptive parent. She was not informed of her legal rights as a pre-adoptive parent, nor did DHS tell her that she had the right to appeal within 30 days. 8) Who objected to the removal of the children from Ms Hill’s care? The entire Hill family! They expressed their views in letters, two petitions signed by 24 relatives, and at the Family Group Decision Making meeting (FGDM) held in July 2012 after the girls were taken. In addition, Ms Hill’s pastor, her former DHS social worker, then State Rep Tony Payton, neighbors, friends and the Every Mother is a Working Mother network support the girls’ return. 9) How did the children wind up with another family member? Instead of doing what the family wanted, and returning the girls to Ms Hill’s care, DHS proposed that a family member temporarily take the children. The family agreed only to get the girls out of foster care with strangers. The primary “temporary” carer is a non-blood relative. She has put the children in full-time daycare compared to the full-time one-on-one care they would get with Ms Hill. The household also has questionable associations. This placement is being used to keep the kids from Ms Hill and prolong the case. 10) Has Ms Hill passed the psychological assessment and is considered a suitable adoptive parent? 11) Did DHS agree for the children to be returned to Ms Hill? Yes, twice and then it again reversed its decision. In Sept 2012, a DHS lawyer said verbally they were in support of returning the children. Yet they did not convey this to the court, nor present the findings of the new PCE. In Nov, DHS put in writing that they support the return of the girls. Yet in Feb 2013 they agreed in court to the cutback in Ms Hill’s visiting hours. In March at a meeting with Ms Hill and her lawyer, DHS reversed its position again saying that the children were “doing well” with the distant relative even though they thought Ms Hill was a suitable adoptive parent. 12) Is the case still in court? Yes. 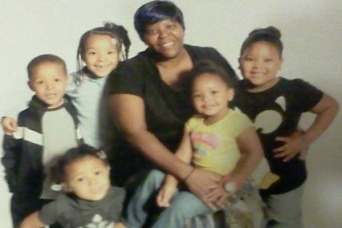 Ms Hill was granted a hearing for oral arguments this coming August 20th in Superior Court in an ongoing struggle to attain standing in the Family Court hearings concerning her nieces. She filed a motion for standing in court in August 2012, however Judge Wright denied this motion at the September hearing. Ms Hill, with the help of a pro-bono lawyer, filed an appeal which led to the upcoming August 20th Superior Court hearing. But every day this case is delayed means that two young children are deprived of the love and care of their aunt whom they bonded with and had the expectation they would settle with permanently. Ms Hill only got her present lawyer after Every Mother is a Working Mother, who has supported Ms Hill throughout, spent months approaching all the lawyers they knew and were recommended, asking for someone to take on the case. 13) Does Ms Hill get to see the children? She was seeing them eight hours a month at home and at an agency after they were taken. Yet in February 2013, the Child Advocates claimed the children were “acting up” on return from seeing Ms Hill, so the court approved cutting back the visits to two hours a month at an agency. If true, the only apparent reason that the children were “acting up” is because they were upset at leaving Ms Hill. They should not be punished because they don’t want to leave her. If DHS does not intend to pre-empt the decision of the court by limiting the visits, disrupting the relationship between Ms Hill and her nieces and disadvantaging Ms Hill as a potential adoptive parent, it can go back to court immediately to get the full visits reinstated while the case is being settled. Two young vulnerable girls being taken from a loving home based on prejudicial and discriminatory information. How can the lack of a GED ever be a consideration in assessing whether someone is suitable to care for a child? What are the implications for this considering that in Philadelphia, which is majority people of color, half of all students drop out from high school? DHS misinforming the court on factual matters such as Ms Hill’s status as a pre-adoptive parent, and her housing situation. Inordinate delay. It is a common tactic to drag legal cases out so that children bond with their new caregivers and then for DHS and child advocates to argue that it would be cruel to move them. But DHS had no such qualms when they took the children from Ms Hill who had them for a full year and put them in foster care with strangers. DHS taking advantage of Ms Hill’s lack of information about her rights which she had not been informed about and until recently her inability to find a lawyer to represent her. Specifically, Ms Hill did not know that as a pre-adoptive parent she had the right to standing in court and she did not know she should appeal the removal of the children within 30 days. She also did not know that she could independently file for adoption. Disregarding of the family’s and community’s views that the children should be returned to Ms Hill’s care. * Ms Hill has Section 8 housing. DHS was late in getting them the girls’ birth certificates and social security numbers jeopardizing their ability to stay with her but not her voucher. She was never threatened with eviction. ** Ms Hill and her lawyer have been denied access to the April 9 court record, but Ms Hill has an affidavit on what she heard.